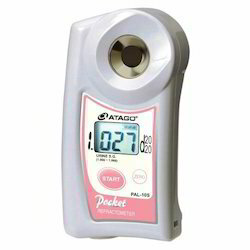 We are one of the leading importers and suppliers of a wide range of superior quality atago refractometers. These are manufactured using superior grade material and extensively used to measure the index of refraction. Offered at market leading prices, these are extensively demanded in varied engineering applications. Released on ATAGO'S 65th Anniversary, PAL-α is a special model with a wide brix range (0-85% ) offered at a very reasonable price. PAL-α is useful for measuring most kinds of samples as well as samples that are the cooking process. Designed with a water resistant feature, the PAL-α can be washed with the same great features as the other PAL units. Our reputed entity is engaged in supplying Atago Refractometer. For Juice, Coffee, Industrial fruids. Cutting oils. New PR-BUTYRO perfect for Butter, Ghee & Edible Oil industry for checking purity / adulteration. PR-BUTYRO has dual scales of Butyro and Refractive Index (resolution 0.0001). 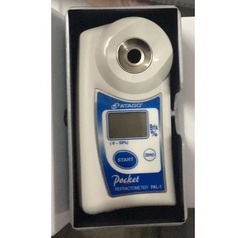 We are amongst the most reputed names in the industry, offering Atago Japan Make Refractometer. With an objective to fulfill the ever-evolving demands of our clients, we are engaged in offering Atago Refractometer. Boghi Engineering And Software Technologies Pvt. Ltd.
We are a top-notch organization, engaged in providing Atago Refractometer.